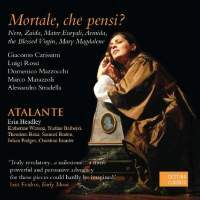 Lirone player Erin Headley (co-founder of Tragicomedia) now has her own group, Atalante, who here present the third volume of an exceptional series investigating neglected music from early-17th-century Rome. Rossi’s three-voice madrigal Mortale, che pensi? is a melancholic contemplation of the fleeting nature of mortality, sung gorgeously by sopranos Katherine Watson and Nadine Balbesi and tenor Samuel Boden; it leads without hesitation into Watson’s enrapturing performance of Carissimi’s solemn ‘Deh, memoria’. For good measure, Headley also throws in the famous final chorus of Carissimi’s oratorio Jepthe, but played by a consort of viols. Christian Immler sings with virtuoso precision and a vivid sense of narrative in Stradella’s solo bass cantata L’incendio di Roma, which describes the drunken Nero laughing as Rome burns and observes the tyrant’s doom. Watson sings with piercing sweetness in Mazzochi’s laments for the grieving mother of the murdered Euryalus (Nisus et Euryalus) and Mary Magadelene (Lagrime amare), both taken from the collection Dialogi e sonetti (Rome, 1638), whereas mezzo-soprano Theodora Baka takes centre stage in an impassioned performance of Marazzoli’s Lamento d’Armida and Boden’s honeyed tenor gently describes the group of Mary at the foot of the cross in A piè del sanguinoso tronco (the music is anonymous but the poetry is by Cardinal Antonio Barberini). Atalante announce that the fourth ‘Reliquie di Roma’ volume will present two oratorios by Mazzochi, and thus this laudable enterprise will continue to offer manna from heaven to composers who remain unfairly lost in the wilderness.